Exploring the wilderness of the Danube Delta from a house rented in Danube Delta is the experience of a lifetime; Delta is home to over 300 species of birds, 60 varieties of fish, 1200 species of plants and trees and embodies 5800 square kilometres of lakes, forests, reed-beds and waterways. One of Europe’s best kept secrets, the Delta is a world class conservation area and a paradise for outdoor enthusiasts. There’s a varied aria of activities for exploring and enjoying Danube Delta: birdwatching, fishing, wildlife spotting, or gently sailing down on the channels admiring an incredible sunset. To fully enjoy your staying in Danube Delta, you’re invited to take advantage of our excellent selection of villas located in the picturesque setting of a traditional Lipovenean fishermen’s village – Jurilovca. Founded by Lipoveni (Russians by nationality or roots) in the 19th century Jurilovca, by the end of the 19th century the settlement grew and became an important fishing center, holding today the biggest community of fishermen in Romania. 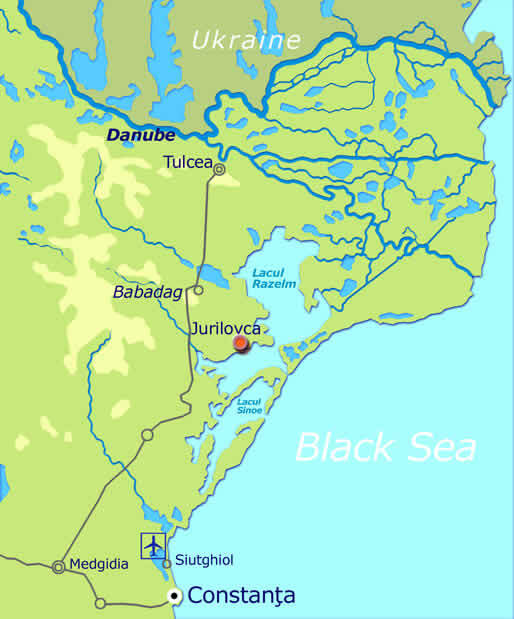 View Jurilovca on the map of Danube Delta. Our packages include accommodation (7days/6 nights) and transportation from/to Bucharest airport. On the house you’re invited to delight yourself with a traditional fish dinner – a culinary highlight of the area! Optional: experienced bird watching guide. 2 bedrooms each endowed with 1 double bed; a living/kitchen well equipped and a foldable sofa which can also be used as an extra bed; a bathroom endowed with a generous bathtub. - Book 2 bedrooms each endowed with 1 double bed; a living/kitchen well equipped and a foldable sofa a bathroom endowed with a generous bathtub. Hot and cold water running. - Book 2 bedrooms each endowed with 1 double bed; a living/kitchen well equipped (automatic dishwasher, refrigerator, gas-kitcheners); a bathroom endowed with a generous bathtub. - Book 2 bedrooms each endowed with 1 double bed; a living/kitchen well equipped and a foldable sofa which can also be used as an extra bed; a bathroom endowed with a generous bathtub. 2 bedrooms each endowed with 1 double bed; a living/kitchen well equipped; a bathroom endowed with a generous bathtub. The generous space of one of the bedrooms allows an extra bed in the room. Price in £ and $ are for guidance only, all payments will be taken in €. The villas, formerly old fishermen houses, blend in perfect with the setting of the village, the exterior of the houses has not been altered at all while the interior has been refurnished and modernized to provide you with all the comfort you need. The holiday houses are located in the south part of the Jurilovca, close to Golgovita Lake, an ideal location for bird watching. From the early hours of morning to dawn, from the terrace of your villa you can spot pelicans flying and fishing in the near by lake. The houses were recently modernized and well equipped and can be rented all year around. The perfect travel companion to help you discover Danube Delta is Dr. Joachim Meyer. From the tiniest insect to the mighty pelicans, our guide, Dr Meyer can keep you up to date with everything that crawls, flies or swims in Danube Delta. Very sociable, with excellent communication skills Joachy is a nature enthusiast! German by nationality, he worked for many years for a scientific publishing house. Irremediably in love with Danube Delta, Dr. Meyer decided to change homes and settled for good in Romania. I really appreciate all your (Transylvania Live) work, cooperation and careness for the coordination of the programme! Mr Meyer Joachim is really a great guide! I can't believe there is someone better than Mr Meyer somewhere at the Danube-Delta & Dobrogea! Free accommodation services for children up to the age of 5. Daily cleaning and cooking services available at request. Learn more on the fishing and bird watching season in Danube Delta! Click here! We also accept payments via PayPal (by credit card, Visa, MasterCard, American Express, Discover or PayPal account),bank transfer and Western Union.